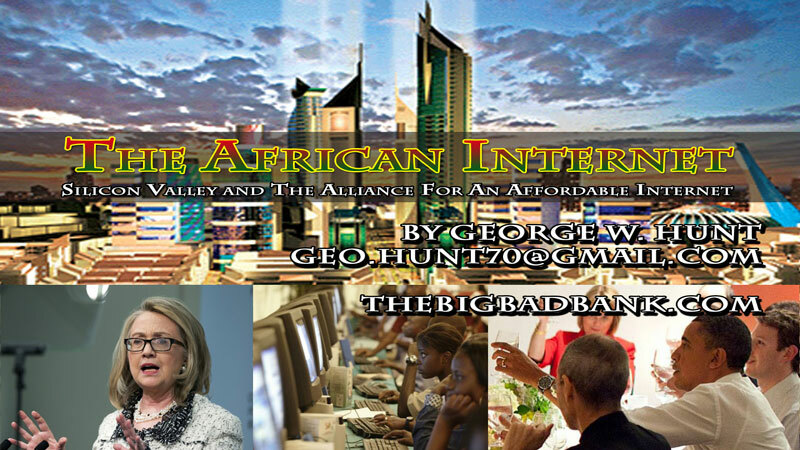 Continuing in this breaking story George Hunt now produces his latest video on how Hillary Clinton and Barrack Obam conspire to fleece the American people of 307 Billion dollars by creating an internet in Africa for bush tribes! George Hunt presents his findings on what the governments 307 billion dollars in grants to the Silicon valley are going to. In this investigation he uncovers the results almost 2 years after the original grants were proposed and we learn that a lot of that money is going in to build an internet pipeline in Africa and bringing African people online. George asks the looming question of why would we want to invest 10 percent of the US budget into Africa. Pt. 2 – Jann Scott interviews George W. Hunt on the new video The African Internet, Silicon Valley and The Alliance for an affordable internet and they dig deeper into the issue of why America would want to spend so much money investing in African internet and providing the continent with more affordable technology resources when the returns on the initial work are so very small in comparison.